CSS enhances web layout and design. Without CSS a website is nothing but a skeleton w/o skin on it. 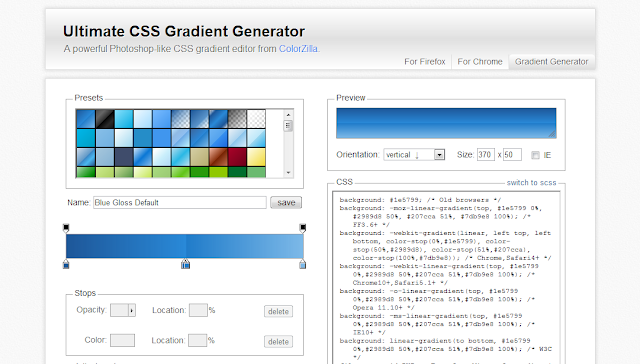 In the recent days We’ve bookmarked some of the useful CSS and CSS3 tools. CSS3 needs some improvement as it is new. The problem with CSS3 is that its properties are browser-specific and can’t be easily implemented throughout the browsers. Web Developers need to add some extra code in order to implement the properties in the same way throughout the browsers. In this post, we’ll spotlight 10 useful and effective CSS/CSS3 generators and tools that can help the web developers with bunch of chores. So let’s checkout these tools one by one below. 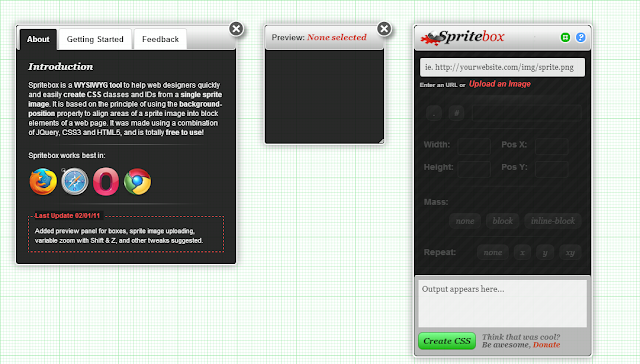 Spritebox is a WYSIWYG (what you see is what you get) tool. Spritebox has the drag-and-drop option that makes it sunnily interactive. Spritebox has support for many of the browsers that are out there on Internet. In Spritebox you need to select a piece of an image, which can be fetched from URL or uploaded from the PC (Computer), and then just define the name of class. And voila this amazing tool will automatically create CSS rules for the background position. CSS3 PIE comes with controls for executing some CSS3 properties, such as box-shadow, border-radius. 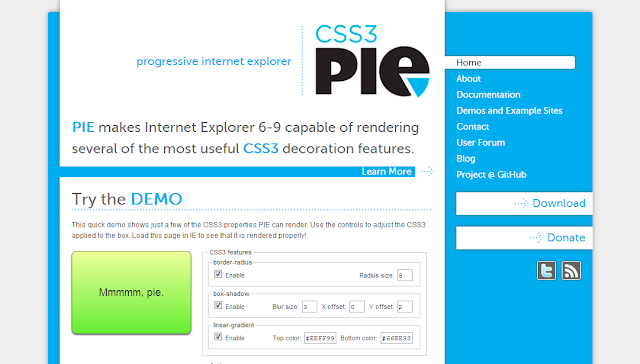 CSS3 PIE also comes with quick demo. Move and control the controls to discover the changes in the box. After that check the check-box to view CSS box and code generated with it. This ultimate gradient editor gives your design/artwork a vivid and colorful look . The ultimate gradient editor has the Adobe like user interface.You can select gradients from the little thumbnails, given in a rectangle or enter value of each bucket manually and then just grab the code and use in your projects. 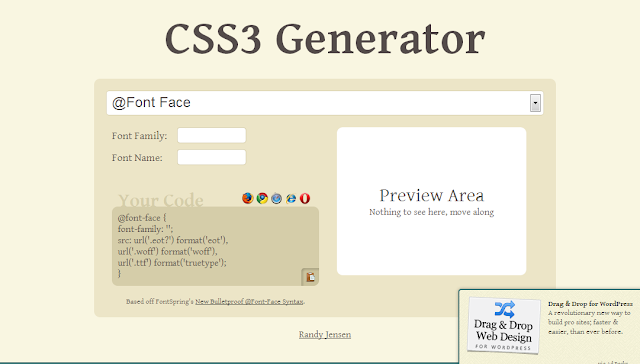 CSS3 Generator assists web developers to generate snippets for various CSS3 properties, that are cross-browser supported. It gives web developers functionality of including text-shadow, box sizing and border-radius. Just click on the drop-down menu select the desired option and generate the code. 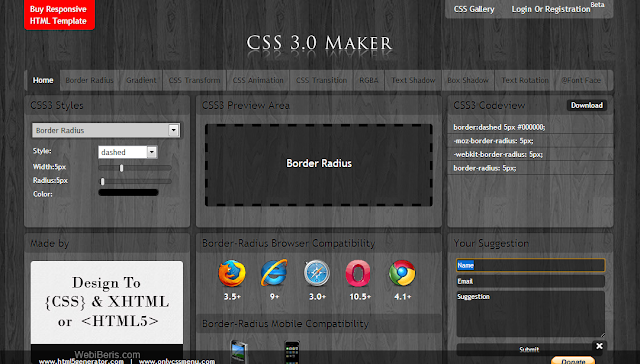 CSS3 Maker is a useful tool that comes with various functions including outline selectors, some transformers and box sizing. Just enter the desired values in the boxes and the code will be generated in seconds, right away with a preview. 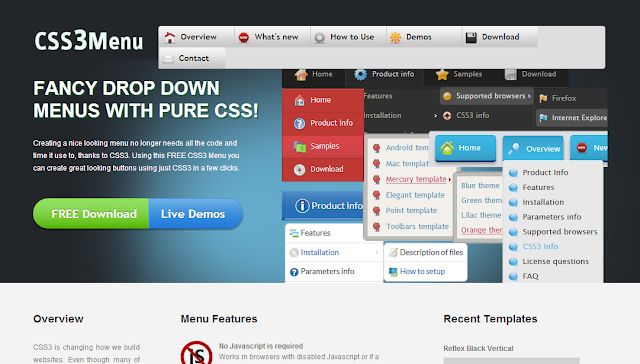 CSS3 Menu makes your design look elegant. Its functionality covers gradients and much more. This enhancing tool reduces the coding time that you need to make stylish menus. Xeo CSS beta is an enhancing and very interactive tool.It assists web developers in designing HTML and CSS web pages without writing any code. It gives you CSS3 snippets as well as ID selectors and classes. CSS3 Patterns Gallery have number of patterns that you can choose from. 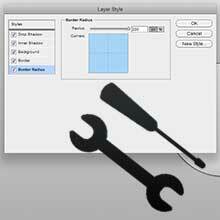 Layer styles provides you an interface like in adobe Photoshop in which you can configure drop shadow, inner shadow, background, border, border-radius, etc. and get the CSS code to use in your own projects. 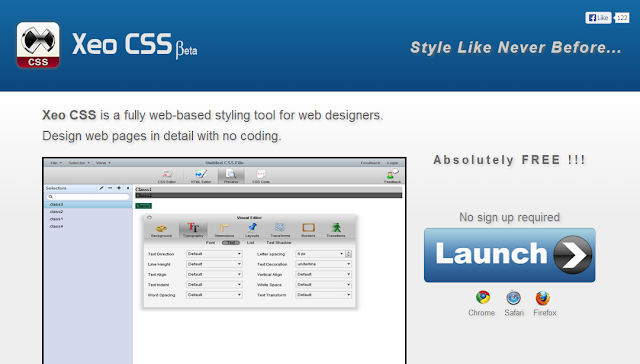 Csstypeset is a tool that helps designers to optimize and enhance the typography in their projects or websites. I hope you enjoyed this post and if this post really helped you don’t forget to share with your friends.